With a thick, succulent brown gravy sauce, this adaption of a "traditional" made for American tastes, Chinese restaurant dish is quick and easy to prepare. A touch of color from the carrot sets it apart. Although this recipe makes the sauce from scratch, prepackaged brown gravy mixes work well when time is short. Though not essential, Kitchen Bouquet® adds to the richness of the gravy. Stir frying broccoli makes for broken broccoli. Steaming the broccoli make for intact florets and a more pleasing appearance. Remove round steak from store wrapping. Rinse under running water, pat dry with paper towels. Wrap in plastic wrap or plastic bag. Place in freezer for 45 minutes or until almost frozen. Remove from freezer. Slice across the grain to make thin strips about 2 or 3 inches long. Set aside. Steam broccoli florets for 3 to 5 minutes (either bamboo steamer, rice cooker or steamer basket) or until just tender to the bite. Remove from heat and set aside. Peel carrot. With peeler, cut in long stroke the length of the carrot to make “ribbon slices.” Set aside. Clean, trim and cut onion. Slice to make thin rings. Cut rings in half. Set aside. Add oil to hot wok. 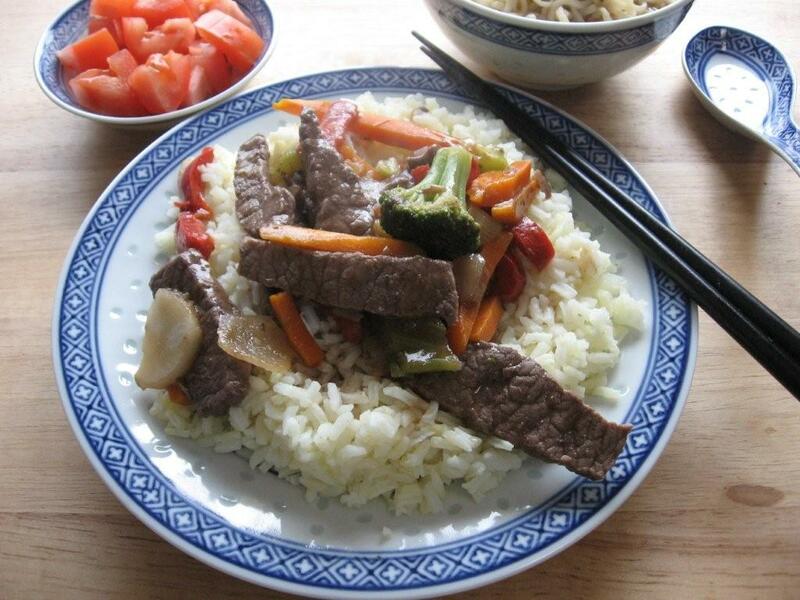 Stir fry meat until no longer pink. Remove meat from pan leaving oil behind. Add onions and stir fry for 2 minutes. Season with pepper. Add carrot ribbons and stir fry an additional 3 minutes or until onions begin to brown. Add garlic and stir fry 1 minute more. Remove vegetables from pan and set aside. Reduce heat to medium. Add butter to wok. When melted, add flour while stirring. Cook and stir until roux begins to darken, about 5 minutes. Slowly add water and consume while constantly stirring. Add Kitchen Bouquet® and continue to heat and stir until gravy thickens, about 4 or 5 minutes. Add reserved beef and stir to coat. Add vegetables and fold into thr gravy being careful not to break the florets. Stop stirring and heat one additional minute before removing from heat.